Let's hope Cranes get the wide string spacing sorted soon - this is otherwise a great parlour. Retro looks and a big small-body sound. The 'wide neck' claim isn't yet a reality. Hudson's Firefly (left) and Little Wing (right). Abalone adorns the Little Wing's headstock and fretboard. The range includes budget boxes, but the main spotlight is on the much more upmarket Vintage Evolution series and the newly launched Lightning Tree series, both apparently sourced from the same Chinese factory as Guild's GAD acoustics. The Vintage Evolutions, of which our Little Wing Parlour is one, concentrate on all-solid-wood specifications and overtly retro influences. A Little Wing was already part of the Vintage Evolution range and remains so. The difference is that this one is a new 'wide neck' version, denoted by the 'W' in the catalogue reference. This should signify an instrument configured for fingerstyle, but the adaptation is overly cautious. Nut width is admittedly increased from 42mm to just over 44mm, and the 'V'-profile is deeper, but string spacing, both at nut and bridge, is unchanged at a quite tight 35mm and 52.5mm respectively. The neck retains a pretty slim span further up too. Questioning Cranes on this, the company concedes that the guitar doesn't yet fully merit its 'wide' monicker, and that future shipments will likely be altered. To what extent we don't yet know, but this is good news because while the guitar handles and plays well in a general sense, it feels cramped for picking, particularly for right hand work. 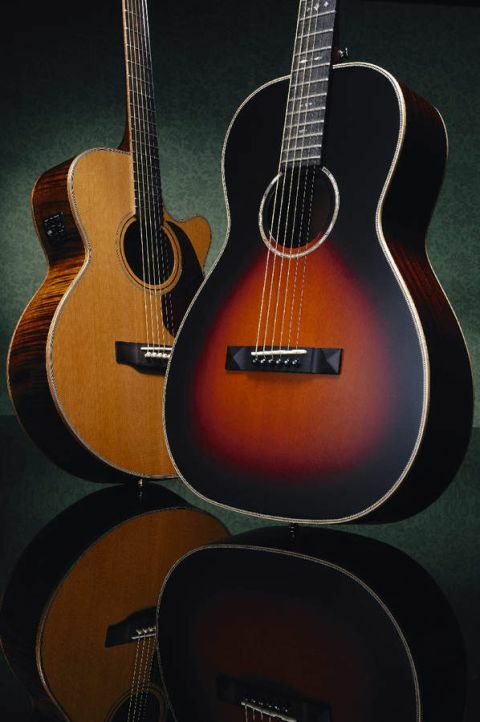 As an 00-style parlour with a lower-bout span of approximately 13.75-inches, the guitar's all-solid spruce/mahogany body is elegantly trimmed with maple binding plus herringbone for the top purfling and the back's centre strip. The pyramid-end bar bridge is also appropriately vintage-like, while abalone does duty for the rosette, the position markers and the slot headstock's vine motif. It's all discreetly tasteful and very tidy, and enhanced to good effect by the body's gloss livery and the top's smoothly graduated, warm-hued tobacco sunbursting. The satin neck carries a welcome second strap button, unusual on a parlour. It's sited very high up the treble side of the heel, though, and looks awkwardly placed, but in practice it doesn't interfere with any high-fret forays which are restricted anyway given the traditional 12th-fret neck join. The HO-1W might not yet be a fully fledged picker, but its sound is very nicely sorted. Aided by its relatively deep sides, the delivery is delightfully boisterous and responsive: the intrinsically bright, snappy tonality underpinned by a degree of low-end presence one would normally associate with a larger-bodied acoustic. Indeed this is one of the most freely voiced guitars of its size you're likely to come across, and a pleasure to get stuck into. 'Wide neck' needs to mean what it says and until that's taken care of, as promised, hardline fingerstylists won't be flocking to buy. The rest of us might, though, because in other respects, particularly sound, it's one of the most enjoyable parlours out there for the money.